James Milligan at Elgin Sheriff Court. 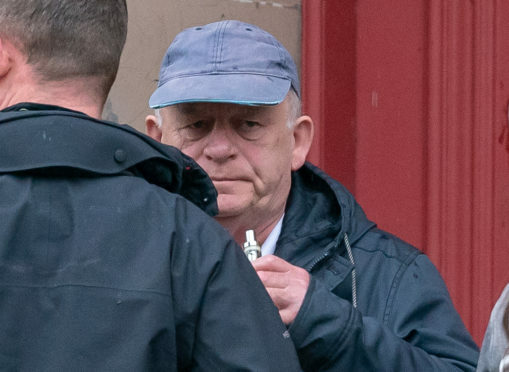 A man who was involved in a Lossiemouth caravan scam that cost victims over £20,000 yesterday avoided prison after he was described as an “unassuming pawn” in the crime. James Milligan, 65, sold three holiday homes at the Silver Sands caravan park in 2008 and 2009. He received payments of £6,000, £7,000 and £8,000 from unsuspecting customers who thought they were buying a caravan from a reputable source. However, after trying to receive documents like proof of purchase receipts they were met with repeated excuses from Milligan. After police started inquiries into suspicious purchases at the caravan park, it was discovered that he was not their owner and the directors of the park, Green Parcs Ltd, had no idea that the holiday homes had been sold. At Elgin Sheriff Court, Fiscal Depute Matthew Kerr said that two of the customers were allowed to keep their caravans, at a massive loss to Green Parcs, while the victims who splashed out £8000 had to give theirs back because it was already owned by someone else. Green Parcs Ltd later filed for bankruptcy. Milligan, of Birch Grove in Dalbeattie, lived at Silver Sands with his wife who ran the shop there while he did odd jobs around the place, including cutting the grass. According to defence solicitor Grant Dalglish, Milligan was asked to sell caravans on behalf of the park by the site manager who told him to tell customers that they were his. Mr Dalglish said: “My client was an unassuming pawn in the site manager’s game and was told to only take cash and cheques for the caravans as the business accounts were all ‘up in the air’. “None of the cheques went to Mr Milligan’s account and he received a nominal fee of £50 to £60 for each sale as the cash went straight into the site manager’s pocket. Sheriff Olga Pasportnikov said that Milligan “should have smelt a rat” after being told to hand the money straight to the site manager but accepted he was not completely to blame. Milligan pled guilty to three charges of fraud and received a seven months restriction of liberty order.